Why are millennials not buying jewelry? It’s a common exercise in science fiction to analyze the psychology of large groups, but beyond the work of Isaac Asimov and Frank Herbert, trying to understand the ebb and flow of culture is a massive undertaking that requires entire sociology departments in order to explore even the smallest social phenomenon. Understandably, jewelry retailers, which usually don’t have sociologists on staff, are stuck with a troubling situation that seems to have no explanation or resolution. How can a retailer reach out to a demographic that seems to be averse to the very idea of buying jewelry? Speaking historically, millennials are in a social and economic situation that is unique, relative to that of their parents and grandparents, and reaching out to a prospective millennial customer requires a distinct mixture of boldness and cautiousness by jewelry retailers. James Carville, the famous Democratic strategist, said in 1992 that “It’s the economy, stupid”—that one of the most fundamental concerns of any demographic is its economic security. After the Great Depression, the U.S. economy (accounting for recessions) was on a general upswing for roughly 70 years. millennials’ parents and grandparents lived in an economy that allowed them to be positive about their finances. Luxury purchases, such as jewelry, were deemed acceptable. The Bush-era recession, followed by the economic crisis of 2008, however, created an environment of uncertainty and “money fear” that lasted far longer than any recession of the past 70 years. Millennials have grown up in an economy that doesn’t promise class mobility, a middle-class income, or financial security. Pew Research Center has found that only 33 percent of the workforce is made up of millennials, and as an age bracket, millennials comprise a staggering 48 percent of the unemployed. This means that as individuals, millennials are still hypervigilant about their income. Objects deemed “luxury” are often pushed far down the list of things to be purchased, even by millennials who’ve managed to achieve a stable, middle-class income. A jewelry retailer can’t break an entire generation of its fear of insecurity. That much is impossible. However, there are possible ways to reach out to millennials that take into account their collective “once bitten, twice shy” mentality. Each retailer has its own business model, but millennials as a group tend to be fond of generous and flexible payment schedules. A common fear among retailers, particularly luxury retailers, is that their brand will be tarred with the “cheap” label, and there’s an aversion to playing with the perceived exclusivity or quality of their products. It’s an understandable fear, but in the modern era, most retailers don’t have the leeway to act as gatekeepers of luxury for millennial consumers. The millennial is a consumer who has to be wooed by a proactive and accommodating business, if only because a prospective millennial customer is comfortable with shrugging off a jewelry purchase entirely if they don’t feel comfortable with how that purchase will fit into their budget. Along similar lines is the fact that millennials are a “protest generation”. Much like the millennials’ great-grandparents from the Great Depression era, millennials have grown up in a period of extreme cynicism toward financial institutions, high-income individuals, and even capitalism itself, according to the IOP Spring 2016 Poll from the Harvard Institute of Politics. This presents a particular problem for jewelry retailers because of the jewelry industry’s association with “luxury” and “opulence”. 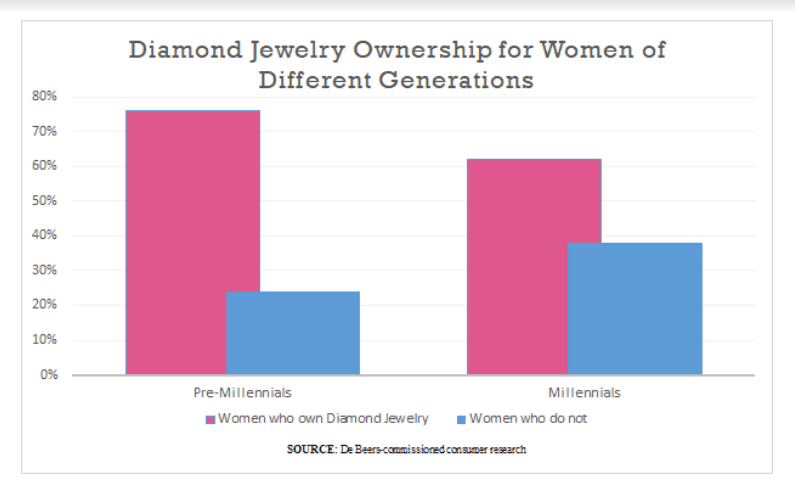 This doesn’t mean that millennials dislike jewelry in itself, but they are skeptical of the current industry built around jewelry. Again, there isn’t a simple way to resolve the issue of distrust, but it can be ameliorated by jewelry retailers adopting humility when it comes to millennials. “Humility” here means a willingness to communicate with millennials on their level, rather than communicating solely through the advertisement methods that worked for their parents and their parents’ parents. Millennials are looking for outreach, and if jewelry retailers want to make that effort, social media is the ideal route. 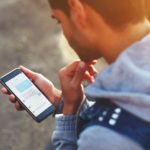 Millennials spend most of their day connected to the internet, and studies have shown that they dedicate between two and five hours each day specifically to social media. If a jewelry retailer is looking for millennials, that’s the avenue through which younger consumers can be reached. But it’s not simply a matter of X business creating a Facebook page to announce when it’s got a new selection from Tacori. After all, a millennial looking for rings might go to Etsy or eBay to do business with a single artisan or a small workshop instead of heading to the nearest jewelry retailer or its website. As discussed, humility is one of the easiest ways for a retailer to appeal to millennials. In this case, a retailer could take the time to make connections with young creators. Inviting young people to engage their peers on behalf of the jewelry industry is an investment that could reap big dividends for a retailer. For example, a millennial could be given carte blanche jurisdiction over a retailer’s Twitter account to write amusing posts that generate goodwill in the digital community, as well as advertise for the retailer’s jewelry. Injecting charm, wit, and personality into a social media account is a method that’s provided plenty of buzz for companies as disparate as Delta Air Lines and Arby’s. Approaching local millennials, inviting them to write about, or create art for, the business appeals to other millennials. There are many routes to reach the millennial consumer, but they all begin with engaging the generation on its own terms. Beer, of all things, could provide quite a few lessons about millennial consumers to the jewelry industry. Take into consideration Coors, the Miller Brewing Company, and Anheuser-Busch, the three beer companies that have dominated the U.S. beer market for decades. Between 2010 and 2014, craft-beer managed to go from 5 percent of the volume share of the beer market to 11 percent. The Brewers Association estimates that craft beer sales will continue to steal market volume from the three major brewers for the indefinite future, leaving the major breweries struggling to adjust to the fact that millennial beer-drinkers are rejecting in record numbers the tastes of the previous generations. Whereas millennials’ parents and grandparents were enticed by businesses creating standards of quality, millennials are far more interested in the unusual, the obscure, and the authentic. A casual perusal of Amazon Handmade, Amazon’s method of competing with Etsy, turns up jewelry made out of comic book pages set in acrylic glass; rings made of brass, gunmetal, or even mahogany wood; and necklaces made from recycled coins. This isn’t a call for jewelry retailers to change the entire model of their business, but it is the case that a great deal of millennials favor the weird and one-of-a-kind. A retailer willing to devote some space to artisanal or locally made jewelry (easier in an e-marketplace) might tempt millennials to also look at the traditional fine jewelry offered. The jewelry industry is justifiably concerned about appealing to millennials. But as the post-war baby boomers slowly cede their dominance of the consumer base to millennials, it’s incumbent on the jewelry industry to recognize that the market may not return to pre-2008 standards for a generation—if they return at all. Changing tastes and mores mean that retailers may have to take the first step in reaching out to a generation of wary, aloof consumers and promising them a jewelry experience that retains its aesthetics, but also brings social awareness, artisanal charm, and a local connection to the table. Ray Moheet pursued a double major in Civil Engineering and Business Management with a focus on Digital Marketing at California State University Northridge. During that time, he worked his way from Zales up to management at an independent retailer. His brother Ali had a wealth of scientific, technical, and computer knowledge at his command, and Ray had become a master of marketing strategies and the intricacies of jewelry retail. Their shared project and passion is i-Showcase. Visit Our Site. The traditional jewellery store model is an anachronism or soon will be unless they change the model away from the typical diamond, ruby, emerald and blue sapphire model. Talk to the new designers across the developed world and see where millennials are buying there jewellery. It’s not that they are not buying it’s just that they are buying differently.